Wasserhund donates a percentage of all taproom sales to a local charity every month. Every month we have a check turnover where we present money to the previous month’s charity and introduce the new charity. We have presented over $100,000 to date in cash to various local charities. One of my favorite quotes on success is from Thomas Jefferson: “I find that the harder I work, the more luck I seem to have.” What I have found throughout my entire adult life is that if I work hard and smartly, I seem to have more success in my endeavors. From my days as a college student, to my time in the Navy, to opening Wasserhund Brewing Company, I’ve given my everything in all I do. My father used to always ask me, “Did you give it your best effort?” If I said no, he would simply ask me, “Why not?” I always hated answering that question and I still do. Success is not having to answer the second question. What person or experience has made the biggest impact on your life? When I was 25 years old, I became a Christian. It changed my outlook on life, the way I treated people and the way I view others around me. Wasserhund is owned by my wife and myself; giving back to our community, the relationships we have forged and how we run the business have been impacted greatly by my outlook on life. There are a lot of things I could talk about when answering this question, but truthfully, I would say marrying my wife, Christine Holley, is and was the biggest accomplishment of my life. She is my high school sweetheart and my business partner. In high school she did not like me nearly as much as I liked her, but I pressed on anyway. When I first met Christine, one of my buddies asked me if I was going to date her, and I responded with, “I am going to marry her one day.” She has been through everything with me, and I could not imagine doing anything without her. What is the best compliment you have received from a colleague or manager? Brewing beer has a lot of science, engineering and process optimization involved, but in the end when a brewer creates a new beer recipe it is similar to a painter creating a portrait. When we create something, we want it to taste exactly how we imagined it would. We also want our colleagues to love the beer as much as we do; after all, we are sharing with them something we love. I strive for people to love my creation, and every time a brewer or someone who as a real knowledge of beer says that they like my beer, the accolade gives me feelings of recognition for my efforts. I was a typical boy, and what I wanted to do when I grew up ranged from being an astronaut, a fighter pilot, to a professional football player. My parents always told me that if I really put my mind to something, I could be anything I wanted to be. Both my parents encouraged me to do well in school and do everything to my fullest and that if I lived my life in that manner there would never be a closed door. I went to college on a Navy ROTC scholarship with the intent of becoming an F-18 pilot. During school I found that I really enjoyed my engineering curriculum and changed my dream to becoming a design engineer in the Navy. 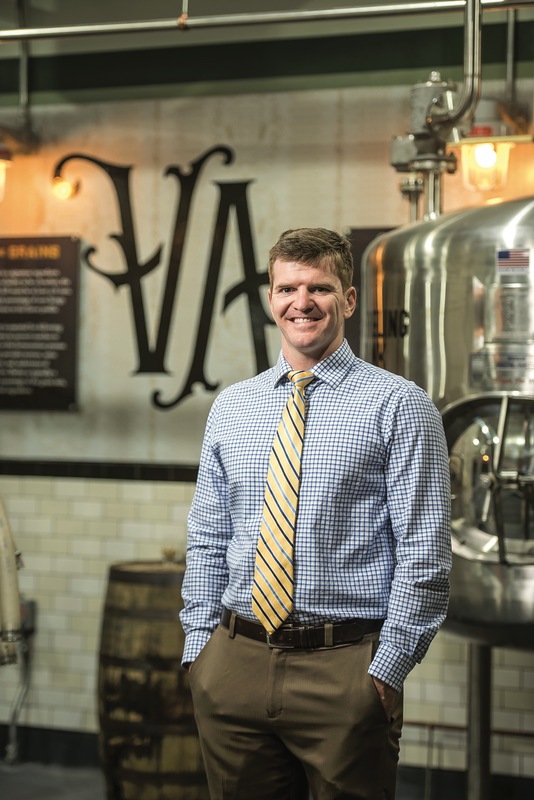 I spent my five years in the Navy in Washington, D.C. designing the reactor cores for the Navy’s new prototype, but during that time in the Navy I found that making beer was my true passion. I wrote a business plan, convinced my wife, and we have been running the brewery ever since. My dream changed as I matured and found out what I really enjoyed. Name a book that has inspired you professionally. I’ve read a lot of text books and leadership articles, but what got me started in my current passion was The Brewmaster’s Bible. What is your favorite restaurant for a lunch meeting in Coastal Virginia, and what do you order when you go there? Tubby’s Tavern. When I go for a meeting I typically order Wasserhund’s Doggy Paddle IPA and fish tacos. Is there anything you would change about your generation as a whole? If so, what? I do not think so. I feel like millennials get the short end of the stick because we have the ability to share our thoughts to the world via social media and we are the first generation to be able to do that. In the end, we just want what every generation before us wanted: a stable job, decent pay and a feeling of inclusion. What do you think is Coastal Virginia’s biggest challenge? The biggest challenge to Coastal Virginia is its size. Many people associate the city that they live in to the community they identify as. 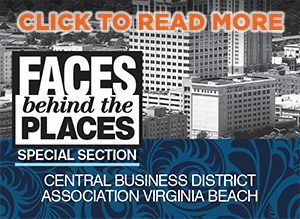 Someone who lives and works in Norfolk will not go to Virginia Beach often, even though the cities are neighbors. How can Coastal Virginia better retain its younger population? A lot of young people enjoy having things to do after work or on their days off. In the last few years there has been a push from cities to bring breweries, wineries, distilleries, arts, restaurants, etc. into their cities. I think that Coastal Virginia is doing a pretty good job at trying to allure millennials to the area. What is something that give you hope for the future? There are a lot of things that keep me going, but in the end it’s my children, Titus and Andrew, who give me the focus and hope I need. I just want to leave behind a better planet, more opportunities than I have and a great set of morals for my children and anyone I work with.